After a period of peace the group attempts to put the newcomers to work, leading to a supply run that turns into a walker war zone. Meanwhile, Rick must decide whether to lower his guard after encountering a woman in the woods. The group faces a brand new threat when a virus creates new walkers inside their walls. Carol takes a pair of young girls under her wing, and Rick attempts to eliminate a horde that is threatening to bring down the community's outer fence. When an infection blazes through the prison, the council decides to send a group in search of antibiotics. Tyreese mourns a loss, and Hershel puts himself at risk to help the sick. Rick and Carol go in search of food, where they encounter a young couple who are eager to join the group. Meanwhile, Darrell's group must find a new car in order to complete their vital mission. Hershel fights to keep the sick population alive inside the quarantine, despite the dwindling supplies and morale. Rick returns to the prison with news about Carol. In the wake of Woodbury's destruction the Governor is taken in by a small family, and soon finds that he has become an indispensable part of their lives. The man once called "Governor" joins a new group of survivors, hoping to maintain a low profile while protecting those he loves -- only to be tempted back to his old ways by the realities of this new life. "Brian" convinces his group to take up arms in an attempt to take the prison away from Rick and the others, leading to a stand-off and what may be an inevitable, bloody confrontation. Now on their own, Carl and a wounded Rick bicker over how best to survive in a world without the security they had built up around themselves. 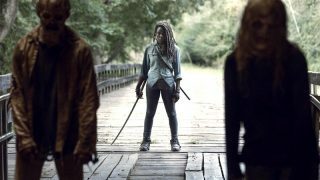 Elsewhere, Michonne struggles with her solitude as she dreams of the life she lost. In the wake of the prison disaster Daryl and Beth search for signs of other survivors, while Tyreese attempts to survive in the wild with a group of children. Maggie goes in search of Glenn, who is facing a new challenge back home. Michonne and Carl revisit their tragic pasts while out in search of supplies, while Rick finds himself alone in a house suddenly occupied by a band of strangers. Elsewhere, Glenn meets a new group with a big mission. Life with Daryl grows increasingly frustrating for Beth, who determines that she is going to find her first real drink -- leading them toward a very personal confrontation. Bob and Sasha go in search of Maggie, who has struck out on her own to try and find Glenn. Elsewhere, Beth and Daryl find a measure of safety in an abandoned funeral home. Carol and Tyreese consider staying put after discovering a home hidden in a peaceful grove -- but young Lizzie and Mika's inability to deal with the reality of the new world grows increasingly obvious, culminating in a shocking act. While Glenn presses Abe and his people onward in the hopes of catching up with Maggie, Daryl finds it difficult to adjust to his new group and their rules for maintaining order. After a reunion and a devastating ambush, the survivors arrive at Terminus and find the colony suspiciously idyllic. Meanwhile, Rick recalls his old life at the prison, and his decision to try and leave a life of violence behind him.